Our Domaine Eden vineyard site is totally different from Mount Eden’s Estate vineyards. Although only two miles apart, the contrast is based on soil type and the unique ability of Pinot Noir clones to reveal the differences in a soil. Mount Eden’s Estate soil is shale and rock. The wines are soil-driven. While Domaine Eden’s soils are beautifully textured loam devoid of rocks, these wines are fruit-driven. In addition, at Domaine Eden the vineyard is a compilation of many clones and selections. The complexity they create is paramount: from the heritage selections Mount Eden, Swan and Calera to the “Dijon” clones 115, 667, 777 and 828. 2013 is a concentrated, drought stressed year that started early. The winter rains stopped after January 1st and winter was warm. As a result we started harvesting in late August, a full two weeks earlier than normal. The wines show a dense and seductive aroma of plum, wild strawberry and mountain lilac (yes they are in abundance surrounding the vineyards.) On the palate the 2013 dominates with an intense core of red fruit. Quite youthful at this point, yet it still retains the lift and elegance that is the true nature of Pinot Noir. While this wine’s Mount Eden sister bottling may better stand the test of time, the Domaine Eden is what most people will most like to drink right now, and it’s cheaper too. Aromas of dried violets, uncrushed boysenberries and pencil lead make for an ethereal nose that seems to hold secrets one must uncover. Precise tannins on the palate offer floral yet savory flavors of black sesame, nori, violet and mulberry. It’s mellow yet mysterious. 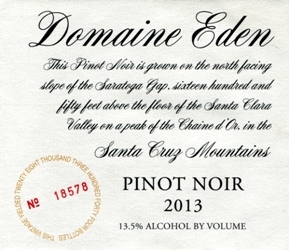 In the cooler 2013 vintage, the Domaine Eden Pinot Noir is a full point lower in octane than the riper 2012. The wine is beautifully light cherry in color and offers up a fine aromatic constellation of cherries, a touch of beetroot, gentle spice tones, a lovely base of soil, delicate notes of cocoa powder and roses and just a whisper of vanillin oak. On the palate the wine is medium-full, bright and intensely flavored, with a nice touch of sappiness at the core, a properly primary personality, just a bit of ripe tannin and lovely focus and grip on the tangy and long finish. This is really lovely juice, and though it is made to be approachable out of the blocks, I would really be inclined to tuck it away in the cellar for at least a couple of years and really let its secondary layers of complexity emerge. A great bargain! 2018-2035+. Sporting a deeper ruby color, the 2013 Pinot Noir bottled under the Domaine Eden label has a terrific bouquet of black currants, dried spices, forest floor and dried herb/hay. Rich, nicely textured, balanced and polished on the palate, with a great texture, drink this charming, outstanding, polished and layers beauty over the coming 5-7 years. It’s another terrific value from the estate. The 2013 Pinot Noir is an attractive wine to drink now and over the next few years. Freshly cut flowers, mint, sweet red cherries and hard candies give the 2013 its lifted, gracious personality. The inclusion of 10% whole clusters adds to the wine’s aromatic presence and overall brightness.